The latest software that enables you to build a DAQ system without programming. 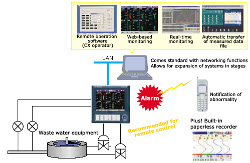 Designed for maximum compatability with Yokogawa recorders, data loggers, temperature controllers, and power monitors, GA10 can also acquire data via Modbus communications. Easily handle daily tasks with powerful data management functions. This must-have software maximally leverages the advantages of paperless systems.